Since my last post was about the art of the genuine apology, it seems fitting to spend some time on its counterpart: forgiveness. In her book How Can I Forgive You? : The Courage to Forgive, the Freedom Not To, Dr. Janis Abrahms Spring describes 4 approaches to forgiveness, and notes that they are not created equal. The four are: Cheap Forgiveness, Refusing to Forgive, Acceptance, and Genuine Forgiveness. Cheap forgiveness is what Dr. Spring calls “a quick and easy pardon.” It is premature, superficial and undeserved, and usually happens when the person who has been hurt has a hard time tolerating the distress that acknowledging the hurt would create (in themselves or in the relationship), and seeks instead to smooth things over as quickly as possible. Cheap forgivers are sometimes prone to conflict avoidance or have a self-sacrificing approach to relationships, and struggle to set healthy limits or speak up for themselves. The harm of cheap forgiveness is that paving over or denying a hurt doesn’t actually do much to heal it, and the fall-out from those unhealed hurts has a way of leaking out and poisoning a relationship. At the oppo site end of the continuum, those who refuse to forgive resist letting the offender off the hook, even after a sincere apology has been made. They respond with distance and condescension, and use hoarded past offences to build a wall fortified with righteous indignation. If engaging in relationship is always a balance between connection and protection, non-forgivers plant their feet firmly in protection, and cost themselves the closeness and repair that forgiving a sincere apology could offer. But what if no apology (sincere or otherwise) has been made? What if the offender refuses to acknowledge that their actions were hurtful, or worse is dismissive and devaluing of the feelings of the one they’ve hurt? Acceptance is a form of forgiveness whose purpose is to help the hurt party help themselves. It allows the hurt party to acknowledge and take control of their pain, work to heal from the harm they’ve experienced, and decide the level of relationship (if any) they want to have with the offender. Dr. Spring’s book details the process of genuine forgiveness, calling it a “shared venture where two people exchange their care, compassion, understanding, and empathy with each other.” Accordingly, earning genuine forgiveness requires the offender to apologize (genuinely, non-defensively and responsibly), bear witness to the pain they caused (showing their partner they can empathize with how the transgression made their partner feel), and work to earn back trust. So when genuine forgiveness has been earned, what does it look like to give it? 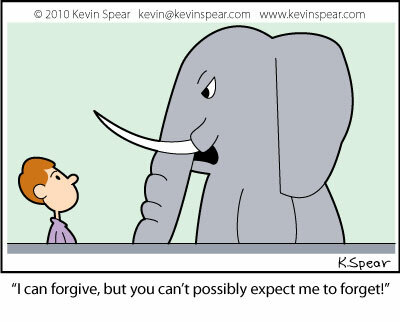 Genuinely forgiving means allowing our relationship to move forward. It means acknowledging that we’ve heard the apology and believe its sincerity, giving our partner a chance to earn back trust, and committing to not bringing up the past hurt the next time we feel scared or angry.